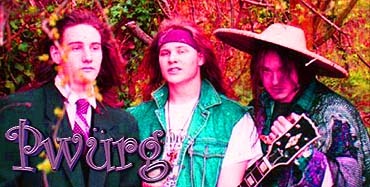 Pwürg was formed in late 1993 by Mr. Lucas Bones (aka Owen) and Prof. Isaac Mangang (aka Damon). It all came together when Bones and Mangang - both bass-playing avant-garde artists with interconnecting social circles - presided over over the birth of a new drum machine, christened Ziggy Reaper Jr. This resulted in some ethereal experimental recordings and the filming of the arthouse classic Mist Raiders. Over a pint or twenty in a dark lonely pub upon Holyport village green, the name Pwürg was invented to describe this indescribable muzak. And from that day forth, alongside casual member MC 1201 (aka Ben Lee) and glossy production mastermind Ray Hurley-Castle, Pwürg began to take over the town. It all truly began with a trip to the CRCMH - from which the legend of the song "Winkipop Surprise" was born. The formation of Pwürg's spin-off company Gratis Surprise Incorporated gave birth to perhaps the most amusing saga to have baffled the people of Maidenhead in decades (See Below). This song, appearing on their debut EP, led the band to explore other local issues and taboo topics that no other act had the guts to speak out about. The band attracted a sizeable cult following, and at least one gigantic party in Bourne End was known to have played their classic "Ricketts" (which gives a run-down on how bad the shops in Maidenhead High Street are) on the stroke of midnight to welcome in 1994 - rather appropriately accompanied by the entire congregation performing the "Pwürg Twist" (created by choreographer Matt Osborn). Even the Maidenhead Advertiser jumped on the bandwagon and insisted several times upon hounding the band for gossip. F**king Airship (Dec 1993) - The debut. Ten songs best described as the foundation of the fledgling Goth/Fairground movement in the UK. The title came from a promotional blimp that refused to leave the skies over the town. Anyone recall? Bad Cheese - The Smell Of Royalty (April 1994) - A punchy and lighthearted 13 track album pointing to a groovier direction. Classic songs and a famous title inspired by an attack on Prince Charles in New Zealand by a student with an aerosol. The Midnite Boogie Sessions (Dec 1993) - A posthumous (so to speak) collection of rambling blues and banana-related tunes from an infamous all-nighter in Holyport. Contains the eloquent ballad "Sunday" - which says it all really. Relaxation defined. Gas Music (May 1994) - Not strictly speaking a Pwürg album, but is Bones & Mangang under the guise of "Monkfish." Nothing short of an avant-garde and experimental psychedelic masterpiece, though largely overlooked at the time. Although asked on many occasions, Pwürg were quite adamant in their stance against performing live. The Hobgoblin in Maidenhead High Street came close to securing them for a night once, but it never eventuated. But wanting a legacy that outshone The Beatles, Pwürg decided to outdo The Beatles. By May 1994, it had become apparent that the band would be forced into dormancy for the simple reason that its founder members would be living on opposite sides of the globe. Thus, they decided to stage a farewell concert - to be carried out in the most appropriate and fitting way possible. Pwürg went one better than the infamous gig on the roof of the Apple building in Saville Row. In that instance, the audience could hear the band, but not see them. Quite typically, Pwürg went against the grain and decided that because the main purpose of a band is to be heard, that their audience should be able to see them but not hear them. As a result, they carefully chose the venue of a footbridge over the busy A423 Maidenhead-Marlow Road and, quite unannounced, set up their gear and ran through a whole treasure-trove of classic numbers. An audience of hundreds upon hundreds of (extremely) casual concert-goers watched in momentary awe as our heroes did their stuff - with only one human being outside the band known to have actually heard the show (an old man walking his dog over the bridge). The event was recorded on a cheap dictaphone, and thankfully, three minutes and three seconds of it were preserved for eternity (the songs "Get Down - And Stay There" and "Big Hair"). These were later enhanced and released posthumously as "The Gig On The Bridge EP" (and will appear in remastered form on the "Bad Cheese - The Smell of Royalty" CD. This Pwürg section of the site will be dramatically expanded with all sorts of info, lyrics, photos and a whole lot more on the band once all of their music is freely available for you to download and experience. Until then, it seems a little premature in putting everything you'd ever want to know about them up here. For the time being, you can always email us with questions about the band. "I downloaded the Pwürg tracks the other day and they are all fantastic!"